Adults and children over 12 years: unless otherwise prescribed, drink 1 freshly prepared cup of Organic Smooth Move® once daily at bedtime. 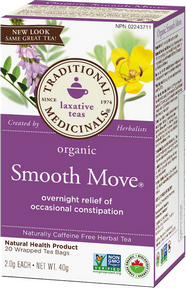 This product generally produces bowel movements in 6 to 12 hours. Children under 12 years: Consult a physician before use. Pour 240 mL freshly boiled water over 1 tea bag and steep, covered, for 10 to 15 minutes. Gently squeeze the tea bag to release the remaining extract. Each tea bag (2.0 g) contains: organic senna leaf (Senna alexandrina) 1,080 mg.
Oil of sweet orange peel (Citrus sinensis) on gum Arabic, organic. Cautions: Do not use this or any laxative if abdominal pain, nausea, or vomiting are present. Prolonged and extended use may cause dependence of the bowel function. This product should not be used longer than 1 week, unless directed by a physician. Do not take this or any laxative within 2 hours of another medicine because the desired effects of the other medicine may be altered. Ileus, acute intestinal inflammation (e.g., Crohn’s disease, ulcerative colitis), appendicitis, abdominal pain of unknown origin, severe dehydration states with water and electrolyte depletion. Side effects: In individual cases, abdominal spasms and pain may occur, particularly in patients with irritable colon. In these cases, a dosage reduction is necessary. Pregnancy and lactation: As with any drug, if you are pregnant or nursing a baby seek the advice of a health professional before using the product..
For nearly forty years, we've been passionate about connecting people with the power of plants. What makes us different? The quality of our herbs, our trained herbalists, and our values. We’re committed to using high quality pharmacopoeial grade herbs and embracing ingredient purity, sustainability, and social and environmental activism. We were and are pioneers in the wellness tea categories and will continue to lead the way. We don’t just make formulas because they sound good. We’re passionate about passing along the centuries-old wisdom of how to use plants for wellness. Every tea and herbal product that we make must have sufficient evidence of safety, quality and efficacy in support of our claim statements and formulation rationale.